Indy, aka Solitary Derika, is a 10-year-old black female born June 8, 2003. Her sire is Solitary Runner and her dam is Declared Leader. Indy has 123 races on record starting in November 2004 and finishing in September 2007. 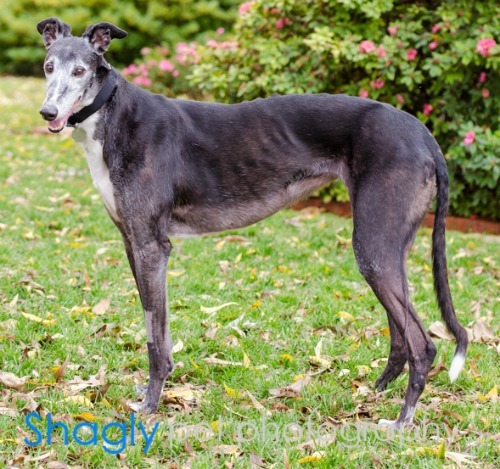 Indy was surrendered to GALT, along with Simon and Zeus, when her owner suffered a stroke that left him paralyzed from the neck down. Indy is being treated by Dr. Dennis Crow of Animal Dermatology Clinic for corns on her front paws. She is taking daily oral medication and periodically her corns are scraped at Dr. Crow's office. The cost for the medication is approximately $40, and it lasts about six weeks. 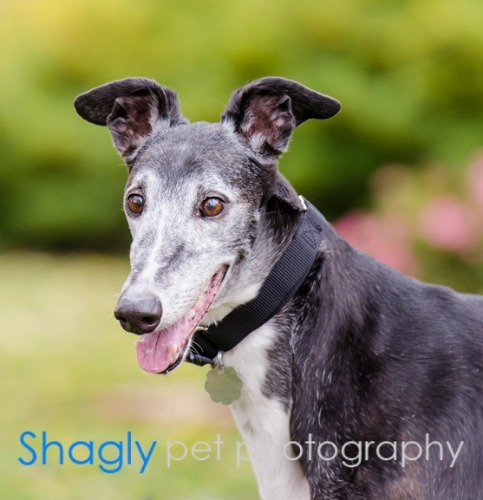 Indy is beautiful and precious senior girl. She has a heart of gold and is easily pleased with treats and love. When she looks at me, her eyes melt my soul. Indy is always the most excited to see me when I get home. She bounces up and down on her front paws, grinning ear to ear and won't leave my side until I give her just the right amount of petting and love. She gets along well with other dogs and is cat friendly. Her favorite pastime is spending time on her bed outside. She will stay outside for hours and often needs to be bribed with treats to come back in. A walk is always a big hit, she loves to take in the scenery. However, Indy is currently being treated for corns. so I limit the distance to shorter strolls. If your heart can take it, love, love, love is all you will receive from this girl. Love in return is all she wants.